You can play the entire hand, showing your cards at the end, with the pot going to the player with the strongest hand. Or you can cause all your opponents to fold their cards by playing in a way that suggests you have the strongest hand. Even if your hand is weak, if all the opposing players fold, you are the winner. Most poker games require either that you pay an ante or a blind before receiving your cards. These are obligatory bets to ensure there is money in the pot on every hand, and to keep the momentum of the game going right from the beginning of the hand. 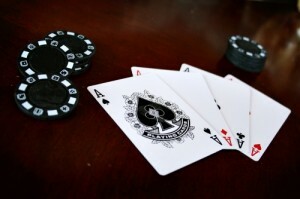 All players who wish to be dealt cards to start the hand post antes. Blinds are posted by the two players immediatelyleft of the dealer. The dealer (from where the cards are dealt) is represented by a round piece that says ‘Dealer’ or ‘D’. The dealer’s position at the table is rotated after each hand – in this way a different player pays the blind at the start of every game in order to ensure fairness. Blinds are measured by the limit of the table – the limit being the amount of money you are allowed to bring to the table. There are two blinds – the big and the small; typically the small blind is half the amount of the big blind, but can also be an amount ranging from one third to two thirds of the big blind. Check:If you are the first player to act in a betting hand, you will have no previous bets that force you to involve funds. This means that you can ‘check’, passing the play onto the next player while still being an active participant in the hand. Bet:Again, as the first player to act, you can choose to place a bet with the intention of winning the pot and showing that you have a hand worth your money. Call:This is an option you will have after a player before you has placed a bet or raised. This will require you to match the bet amount if you want to continue playing the hand. Fold:If you do not wish to continue playing a hand, you can choose to withdraw, or ‘fold’. Your cards will be returned to the dealer, and you will stay out of play for the rest of the hand. Your game strategy and style is what determines your enjoyment of the game. Do you sharpen your poker skills by bluffing, do you raise the stakes and cause your opponents to make mistakes, or do you rely on the strength of your hand and play conservatively? The more you play, the more defined and sophisticated your style will become. But never forget, no matter how skilled or experienced you are, luck also plays a part in your hand.